Next week’s inaugural East Asia Summit, is shaping up as a bid for economic control of the region between China and countries such as Japan, India and Australia, who will attempt to limit China’s burgeoning authority in Asia and, in the case of Japan and Australia, ensure that the views of the excluded United States are well represented. The conference, due to be convened in Kuala Lumpur on Dec. 14, will consist of the 10-member Association of South East Asian Nations (Asean) countries plus China, Japan and South Korea (known collectively as Asean plus three), as well as India, Australia and New Zealand. 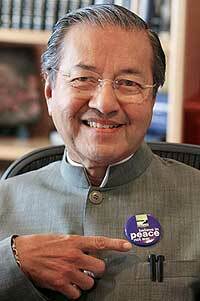 The brainchild of the controversial former prime minister of Malaysia, Mahathir Mohammed, the summit was originally conceived as an “Asians only” affair representing the views of strictly East Asian countries. However, the anti-Western Dr. Mahathir, who remains influential in the region despite retiring from political office, has criticized the involvement of non-Asian countries and particularly the presence of Australia, calling the country “neither East nor Asian.” Mahathir has accused Australia of acting as the United States’ loyal “deputy sheriff” saying he feared that “the views of Australia are likely to dominate” and that his original vision of East Asian nations discussing common purposes will be undermined. China has already accused Japan of attempting to move the focus of the summit, and any future “East Asia Community” agreement, away from the Asean plus three nations — the countries China wants as the community’s core — towards a more diverse regional influence that would include Australia and New Zealand. China sees this as a blatant attempt by Japan to dilute its growing economic and political influence in the region. “Asean diplomats believe Japan is trying to drag countries outside this region such as Australia and India into the community to serve as a counterbalance to China,” the Chinese government’s official People’s Daily newspaper reported. “Analysts say, Japan would most probably dish out the ‘human rights’ issue and draw in the United States, New Zealand and Australia to build up U.S., Japan-centered Western dominance. At the same time, it will particularly highlight the differences in political and economic systems between developed countries such as Australia, New Zealand and the R.O.K. and developing ones including China and Vietnam, in an attempt to crumble away cooperative forces and weaken Chinese influence in East Asia,” the paper said. “A thought leader is one who through fate is forced to face up against some sort of very difficult issue earlier than others,” Aso said in his first major speech as foreign minister. Aso also reminded South East Asian nations that it was his country that had provided $21 billion in cash to assist countries during the 1998-99 Asian financial crisis despite the fact that Japan was itself in the grip of a recession. In a rebuff to China, Aso also called for the inclusion of pro-Western countries such as Australia and New Zealand in the full East Asian community calling them “new peers” in an optimistic future for the region. Aso’s previous comments of “U.S. first, Asia second” has raised doubts among fellow Asian nations about Japan’s commitment to the East Asia Summit. Some observers believe Japan sees any Asian community forum as a sideshow in relation to its deep political and economic ties to the United States. Australia, the other summit nation with strong U.S. ties, was initially reluctant to attend the summit believing it would undermine its close treaty obligations with the United States. However, Prime Minister John Howard pragmatically agreed to attend despite Australia’s historically close economic and political ties to the United States because much of Australia’s future prosperity — and that of all countries in the Asian region — is linked closely to the reality of China’s enormous economic expansion in recent years. Howard’s conservative government, along with its Asian trading neighbors, sees the Chinese thirst for Australian raw materials as being more beneficial to the Australian economy than the American’s need. Many Asian nations justify the exclusion of the United States from participation in the East Asia Summit on a perceived lack of interest in the region by the Bush administration, which seems more concerned with foreign policy issues such as Iraq. The United States, however, though irritated by its exclusion and concerned about China replacing it as the regional superpower, has downplayed the issue having expressed a belief that it still has a very important role to play. “We — in security terms, in economic terms, in political terms — are intimately linked to affairs in the region and I think that we all recognize a shared interest in meeting common goals. And there are just innumerable examples, innumerable examples, and I don’t think this East Asia Summit does anything to attenuate that partnership and cooperation,” Ereli said to reporters. Some experts have suggested that with such divergent interests on display, and with intense and deep-seated regional rivalries already on show prior to its commencement, the most that can be hoped for at the inaugural summit is a solid commitment to setting a date for future summits.